I love fine dining and the meal I had at Tom Aikens Restaurant was one of the best of its kind. Sometimes though I’m just not in the mood for fancy food, but Tom Aikens has that covered too. 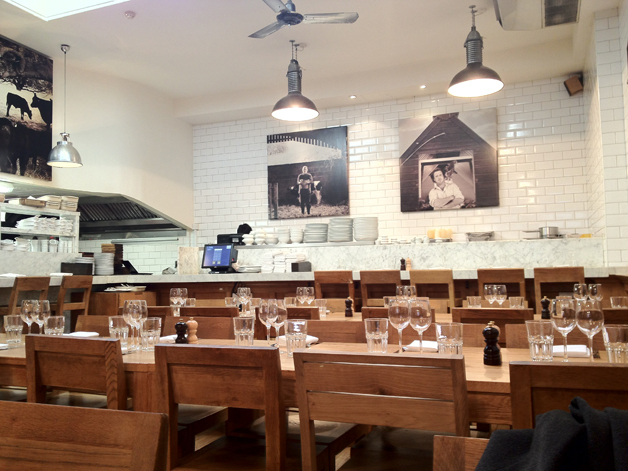 Tom’s Kitchen is a much more casual and affordable sister restaurant serving up a fairly large menu of mostly British, French and Italian classics such as fish and chips, steak tartare and risotto. It’s advisable to book on Fridays and weekends though as the place quickly filled to capacity on my Friday lunchtime visit. Tom’s Kitchen is aptly named considering its kitchen-like decor. The service is efficient, if a little cold and muted. If, like the Euro Hedgie, you think that Kensington and Chelsea is too far out, there is a second branch in Somerset House but with a somewhat different menu. The Kensington/Chelsea branch of Tom's Kitchen is just around the corner from its more high-end sibling. I wasn’t expecting much from the mushroom ragout and although the ragout itself wasn’t as earthy as I would’ve liked the dish came into its own when the quail egg yolk is mashed in. 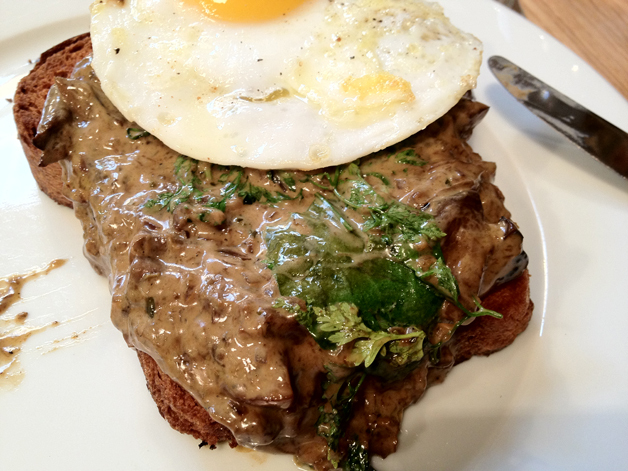 This gives the soft, subtly herby ragout a moreish richness that’s enhanced even further by the crisp butteriness of the brioche toast. Very satisfying. This dish wouldn't work nearly as well without the quail's egg. Looks unappetising, but tastes great. 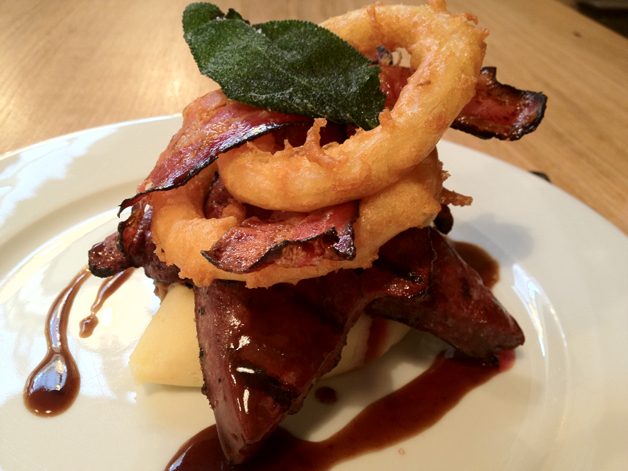 My main course of calves liver, bacon and onions was a very traditional rendition of this classic dish despite its unusual stacked appearance. The calves liver was dense and slightly chewy, but tasted just as you would expect liver to taste like. I wasn’t a fan of the streaky bacon, but the sharply flavoured onions and onion gravy went very nicely with the creamy mashed potatoes. I failed to see the point of including onion rings though, especially when they were too soft and bland with a batter that’s just a bit too oily. It’s overpriced though at £19. The winning streak ends here. 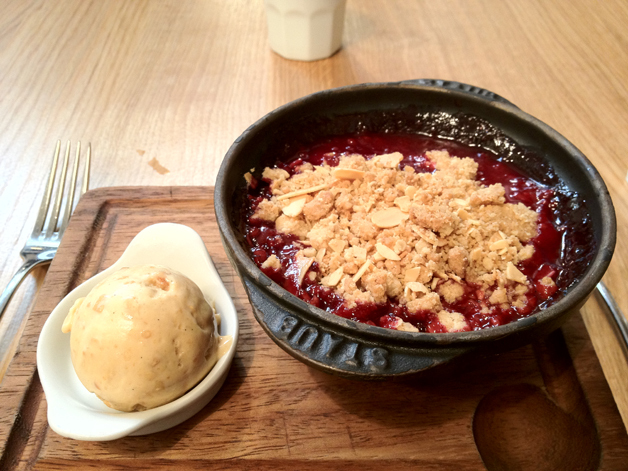 The fruit crumble allegedly consists of stewed raspberries, plums and pears but the dominant taste was of sharp, gritty raspberries. Although I’m a big fan of raspberries, a more balanced and layered concoction would still have been preferable. The bitty yet crunchy crust was remarkably reminiscent of breakfast cereal, which will either be ecstasy or heresy depending on how you like your fruit crumbles. The toasted almond ice cream felt like a tacked on afterthought and tastes more like a plain ice cream studded with large flakes of almond than a fully conceived ice cream in its own right. Overall, average. You could've had it so much better. Most restaurant coffees are totally unremarkable or sometimes just plain bad, but the double espresso here had a dark smokiness to it and was also smooth with very little bitterness or acidity. A very pleasant surprise (sorry folks, no pic of this one). My meal at the Kensington Tom’s Kitchen was a mixed bag to say the least. Some dishes are great, some are just average and others are overpriced for what they are (although that likely won’t matter to the moneyed locals). Although a minimalist menu wouldn’t suit the homely, comforting feel the place is aiming for, the menu is certainly in need of paring down and refocussing to fully justify its relatively high prices. The Kensington branch gets a cautious three stars for now. Reservations: probably a good idea, especially around weekends. Total cost for one person including free tap water and coffee: £43 approx. 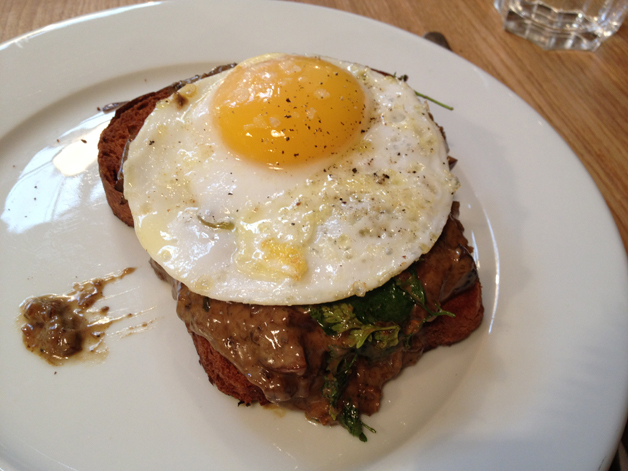 Tags: bacon, crumble, egg, ice cream, liver, london, mushrooms, onion rings, ragout, restaurant, review. Bookmark the permalink. The kitchen like decor is really unique. Never seen that before. I bet that would be a neat dining experience. The food looks great as well.